The olive tree boasts two prizes—the olive itself (called the table olive) and the precious oil pressed from the fruit's flesh. In fact, a third prize is the tree which has a twisted trunk full of character, grey-green leaves, and wood which can be used for carving and furniture-making. Fallen fruit looks edible, but it isn't. All olives, whether green or black, require processing before they can be eaten. The olive tree has been given the Latin name Olea europaea and is from the botanical family called Oleaceae. It is an evergreen that typically grows from 10-40 ft (3-12 m) tall. The branches are fine and many, and the leathery leaves are spear-shaped and dark green on their tops and silver on their undersides. The trees bloom in the late spring and produce clusters of small, white flowers. Olives grow erratically (unless the trees are cultivated and irrigated) and tend to either produce in alternate years or bear heavy crops and light ones alternately. Seedlings do not produce the best trees. Instead, seedlings are grafted to existing tree trunks or trees are grown from cuttings. Olives are first seen on trees within eight years, but the trees must grow for 15-20 years before they produce worthwhile crops, which they will do until they are about 80 years old. Once established, the trees are enduring and will live for several hundred years. Olives mature on the tree and can be harvested for green table olives when the fruit is immature or left on the tree to ripen. The ripe olives are also harvested for processing as food but are left on the trees still longer if they are to be used for oil. Six to eight months after the flowers bloomed, the fruit will reach its greatest weight; and 20-30% of that weight (excluding the pit) is oil. 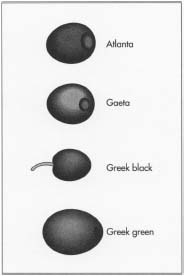 Inside each olive, the pit contains one or two seeds; botanists call this kind of fruit with a seed-bearing stone a drupe; plums and peaches are other drupes. Olives grow in subtropical climates in both the northern and southern hemispheres. Hundreds of varieties are grown; some produce only table olives, and others are cultivated for olive oil. Italy and Spain lead world production of olives; and Greece, Morocco, Tunisia, Portugal, Syria, and Turkey also consider the olive an important part of their economies. Europe produces three-fourths of the world's olives and also leads in consumption of both table olives and olive oil. California has also become a respected producer, especially since the health benefits of the olive have been widely recognized. Cultivation of the olive is as old as the civilizations that encircle the Mediterranean Sea. The indications that people had learned the secrets to making olives edible date from the isle of Crete in about 3,500 B.C. The Egyptians recorded their knowledge of the olive around 1,000 B.C. , and the Phoenicians exported it to Greece, Libya, and Carthage. The Greeks further carried the olive to Sicily, Southern Italy, and Spain. The Romans also mastered olive cultivation. Around 600 B.C. , they had a merchant marine and stock market just for the oil trade. Sardinia and the south of France became olive-growing regions, thanks to the Romans. Olive branches, leaves, and wood gained sacred connotations in both Testaments of the Bible, like the dove's return to Noah's Ark with an olive leaf in its beak. In the Olympic Games in Greece, the victors were awarded crowns of olive branches and leaves. Oil figured in the anointing of athletes, rulers, and religious authorities and was used as lamp oil by most ancient civilizations on the Mediterranean rim. It was olive oil that burned on empty for eight days in the Hebrews' eternal flame during the miracle celebrated as Hanukkah. The olive's fragrant wood was reserved exclusively for altars to the gods, and all of these uses helped make the olive a symbol of peace. In the 1500s, Spanish missionaries brought the both the grape and the olive to California. In South America, Italian immigrants planted the olive, and they were also responsible for plantings in Australia and southern Africa. The olive achieved new fame in California when, in 1870, an inventive bartender added the fruit to a new concoction named the Martinez for the town he lived in; the olive-ornamented cocktail is known today as the martini. The olives themselves are the most important raw material. Depending on the curing method, pure water, caustic soda or lye, and coarse salt are used. Flavorings can be added to the brine. Among the favorites are red pepper or a variety of Mediterranean herbs for black olives and lemon or hot green peppers or chilies for green olives. Fennel, wine vinegar, or garlic can be used to add interest to any olive, but the time required for the olives to take on these flavors can range from a week for whole chilies to several months for a more subtle taste like the herb fennel. Pitted green olives can be stuffed to add color, flavor, and texture. Almonds, pearl onions, sliced pimentos, mushrooms, anchovies, and pimento paste are the most common olive accessories. "Design" of olives includes variety, color with green or ripe olives as the two basic differences, and method of curing. Kalamata olives from Greece are one of the best-known varieties and are distinguished by their purplish brown color and elongated shape with a sharp point. The green Manzanilla is the most famous Spanish olive and is now also cultivated in California. The Nicoise olive from France is famous for the tuna salad that requires the olive as an ingredient. Naturally cured olives can vary in color from a wonderful range of greens to purple, black, brown, and even the small Souri olive from Israel that is brownish pink. The key to the flavor, color, and texture of the olive is the moment of harvest. Obviously, the fruit can be harvested when it is green and unripe, fully ripened to black or any stage in between. Older fruit can be salt-cured or dry cured to produce a salty, wrinkled product. Damaged fruit can still be used by pressing it into oil. It is the combination of the harvest, the cure, and any added flavors that yield the characteristics sought by the producer and consumer. Until recently, most olives available in American grocery stores were artificially cured, meaning that they were treated with lye to remove their bitterness. This is still true for all canned black olives, many of the green olives imported from Spain and the black Nicoise from France, and other bottled versions; however, renewed appreciation of the olive has led to interest in naturally cured olives that are now generally available at deli counters and are bottled by some specialized manufacturers. Naturally cured olives are cured with either oil or brine and additives like wine vinegar for flavor. Lye treatment is done to remove the bitterness of the olive. Olives contain oleuropein (after their botanical name Olea europea), and it is this substance (a compound called a glucoside) that makes them too bitter to eat directly from the tree. According to the purists, lye-cured olives are bland, either spongy or hard (but not crunchy), with most of the flavor gone. Lye-cured olives are also almost always pitted, and the most naturally flavorful part of the olive is adjacent to the pit. Curing with lye softens the olive so it can be picked when it is still hard, but olives to be naturally cured must be more ripe, handled carefully, and processed quickly. In order to produce edible olives, harvested olives are cleaned and then cured in a natural brine of salt, oil, and flavorings or artificially with lye. For green olives, the salinity is increased by 2% every two to three weeks from the initial salinity of 12-14%. Black olives begin their curing at 8-9% salinity; this is increased by 1-2% every two weeks until a maximum solution of 22-24% is reached. Taste of the final product depends upon variety, time of harvest, and curing solution. 1 When olives are harvested by hand, sheets of netting or plastic are placed on the ground under the trees, and the harvesters climb ladders and comb the fruit from the branches. Long-handled rakes made of wood or plastic are used to pull the olives from the tree. There are other methods of harvesting including striking the branches with long canes or using shaped animal horns as combs to scrape the fruit from the branches. Pickers who use their fingers only employ a milking motion to strip the fruit from the trees. Hand picking is preferred by most growers, but it is also expensive. Machine harvesting is a recent addition to the olive grower's arsenal. The machines were borrowed from the nut harvesters and are able to grasp the trunks of the trees and shake them. Each machine has a crew of six to nine men to operate the machine, shepherd the falling olives into the nets, and strike the branches to knock down the stub-born few by hand. The vibrations of the machine shake down about 80% of the tree's burden, and knocking at the branches with staves yields another 10% percent. About 1,100-1,800 lb (500-815 kg) of olives per day can be harvested in this manner. The trees are sensitive to such assaults by machines, however, and many purists prefer hand harvesting. 2 After harvesting of a tree's crop is completed, the nets filled with olives are emptied into baskets or crates, which are then transported to the processing plant. 3 At the processing plant, the harvest bags are emptied into 1,000 lb (450 kg) bins. From the bins, the olives are deposited onto conveyors and moved past a blower that blasts leaves and tree and dirt particles off the fruit. They are washed in pure water and placed in 55 gal (2001) barrels. the percent of salt in solution in the barrels. For green olives, the salinity is increased by 2% every two to three weeks from the initial salinity of 12-14%. Black olives begin their curing at 8-9% salinity; this is increased by 1-2% every 2 weeks until a maximum solution of 22-24% is reached. 5 After curing is completed, the barrels of olives are emptied onto a shaker table and rinsed with clean water. The shaker table sorts the olives by size while inspectors watch and remove damaged fruit. The olives are moved to another station where they are pitted then stuffed. At filling stations, they are put in jars that are filled with an 8-11% saline solution. If the saline is flavored, herbs or other flavorings are also added to the brine. The jars are then capped and sealed for safety. 6 Processing plants may use other methods of curing. Lye curing is accomplished with a solution containing lye, an alkaline byproduct of wood ash. The olives soak in lye solutions for 24 hours (as opposed to the six to eight weeks required for salt brine curing). The lye draws out the oleuropein to remove the olive's natural bitterness and make it edible; unfortunately, lye curing also changes the color and texture of the olive and removes many of its nutrients. 7 Dry (or Greek-style) curing is a method in which plump black olives are layered in barrels with dry rock salt (no liquid is added). The salt breaks down the bitterness and leaches it out. The olives are stirred daily, and purplish liquid leached from them is drained from the bottoms of the barrels. After four to six weeks, the olives are rinsed to remove the salt and glycoside and lightly coated in oil; they are wrinkled and purple in color, and these qualities are unpleasant to some despite the excellent flavor and nutritional value of dry-cured olives. 8 Black olives can also be cured by air curing. The olives are stored in burlap bags that allow air to pass through and around the olives. Over a period of weeks, the olives will cure, although they tend to be stronger in flavor than olives cured by other methods. 9 Green or black olives can be cured in water alone. They should be rinsed once or twice daily and consumed in about two weeks when the curing is complete. Water-and air-cured olives are not stable and should be kept in jars in the refrigerator; brine-, lye-, and salt-cured (dry-cured) olives will keep in crocks almost indefinitely. 10 In 1910, discovery of a method of canning black olives made commercial processing possible. Until that time, processing had been unsuccessful because the olives tended to discolor. The canning method consists of air ripening or lye-curing green olives in an oxygenated solution until they turn black, and treating them with ferrous gluconate. The iron additive fixes the black color, but the whole process removes most of the nutritional value of the olive. The olives are then packed in mild brine and processed in canners using pressure and heat. The quality of olive processing is protected by many sets of hands and eyes. Steps from hand-picking in the grove to hand-culling of olives on the shaker table are monitored by touch. All other processes are watched carefully. Chemistry is regulated by relatively simple instruments, and taste tests help assure the crunch of cured olives and the blending of flavors. Olive producers usually manufacture olive oil as well. Another byproduct that is growing in popularity is processed olive leaves. They are made into tea, put in caplets as crushed leaves, and processed as an extract or in tablets; all forms are believed to aid blood flow and inhibit viruses and diabetes. Waste from olive processing consists of the pits and damaged fruit. The pits are sold as food for pigs, and all other olive waste can be ground and used as organic fertilizer. Some manufacturers return it to their groves to fertilize the olive trees. A ripe future is predicted for the olive business thanks to three occurrences. Medical studies have shown that olives and olive oil are healthful foods that provide vitamins, minerals, and other nutrients. They may reduce the risk of heart attacks and breast cancer, among other diseases. In America, the influence of immigrants from Spain, Italy, and the North Coast of Africa who are accustomed to naturally cured fruit has led to an interest in flavorful olives; specialty growers are reaching this market with carefully crafted, flavored olives. Finally, the "discovery" of crunchy, tasty, nutritious, naturally cured olives by a growing public is leading to the decline of canned ripe olives, which may disappear from the marketplace by about 2010. Klein, Maggie Blyth. The Feast of the Olive. San Francisco: Chronicle Books, 1994. Rosenblum, Mort. Olives: The Life and Lore of a Noble Fruit. New York: North Point Press, 1996. Clark, Melissa. "An Ode to the Olive." Vegetarian Times (October 1997): 136. Hamblin, Dora Jane. "To Italy, Olive Oil is Green Gold." Smithsonian (March 1985): 98. Johnson, Elaine. "Know Your Olive Options." Sunset (April 1995): 164. Kummer, Corby. "Real Olives: In Praise of an Old World Treat, Pits and All." The Atlantic (June 1993): 115. Wing, Lucy. "A Taste of Olives." Country Living (September 1994): 142. Australian Olive Association http://www.australianolives.com.au/ . Australian Olive Association and Information Center. http://pom44.ucdavis.edu/olive2.html/ . Naomi's Olive Page, "An Ode to the Olive" http://www.bayarea.net/-emerald/olive.html/ . The Olive Oil Source. http://www.oliveoilsource.com/ . Santa Barbara Olive Company. Http://www.sbolive.com/ . I have a small orchard of olive trees and need to know what to do with the fruit and how. Thanks for any help.